‘Don’t wash raw chicken’ is the central message of Food Safety Week 2014, which takes place 16-22 June this year. Washing raw chicken risks splashing potentially dangerous bacteria, called campylobacter, onto your clothes, dish cloths, items on the draining board and work surfaces. Campylobacter can cause unpleasant abdominal pain, vomiting and diarrhoea that can last up to five days or can lead to more serious illness and occasionally death. 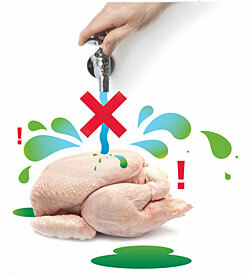 You can’t see, smell or taste this bacteria but to avoid it you need to cook poultry thoroughly (till it’s steaming hot all the way through) and prevent cross-contamination from raw poultry touching other items in the kitchen that are not then thoroughly cleaned – hence the message ‘don’t wash raw chicken’! Research we conducted on behalf of the Food Standards Agency (FSA), which involved videoing people in 20 households and talking to them about what they do in the kitchen, suggested that some people wash raw chicken and other meat because they believe that blood, bone fragments and dirt are best washed away. Anxiety about other people touching the food before it’s purchased also led some people to wash meat and poultry. People in some households went out of their way to avoid touching raw chicken – tipping it from its packaging into a roasting tray, for example. Many people in our study were aware that chopping boards are a potential source of cross-contamination (e.g. 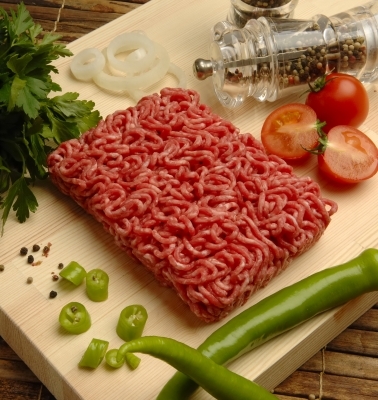 if chopping boards are used to cut up chicken and then vegetables are chopped on the board and eaten raw) – some followed FSA guidance and used one board for raw meat and another for fruit/vegetables – others chopped chicken on a plate rather than a chopping board as they felt it was easy to wash a plate and get it thoroughly clean. See the FSA video on “What’s going on in your kitchen” on potential cross-contamination. What our research clearly highlighted was that kitchen life is a complex business. We all use ‘rules of thumb’ that we learn from a variety of sources, such as friends, family, television, the internet and more ‘expert’ sources like the FSA. ‘Facts’ from these various sources become mixed together and so it is no wonder that we do not always follow ‘best practice’ that keeps us safe. When you are trying to cook dinner, supervise children, feed the dog, empty the bin and stop the cat jumping on the work surface and pinching the chicken you are trying to prepare – do you always remember to wash your hands regularly, use a different chopping board for the meat and the veg, and ensure you don’t spread potentially harmful bacteria by remembering that you shouldn’t wash the chicken? Well done if you do! Our research suggested that it’s this messy entanglement of things going on at the same time that can prevent food safety messages being heard. So, during this Food Safety Week and beyond – try and pay attention to the things that could harm you or your family in the kitchen – but also remember to enjoy your Kitchen Life – whatever that entails.